From time to time, CTR provides academic forums that are not devoted to one theme. The reason for this is so contributors can provide specialized essays on a broad spectrum of topics. This Fall 2016 edition serves as such a volume. Herein, readers can engage two articles pertaining to Old Testament (OT) studies and two related to issues in the New Testament (NT) as well as an individual essay devoted to some of the complexities of theological hermeneutics and another concerning archaeological endeavors at Qumran. 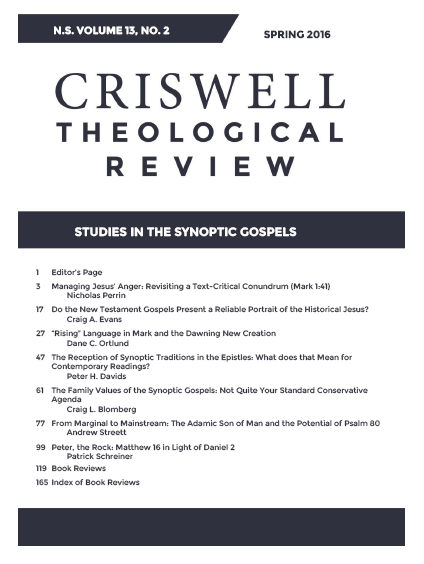 The theme for our Spring 2016 edition of CTR pertains to studies on the Synoptic Gospels. 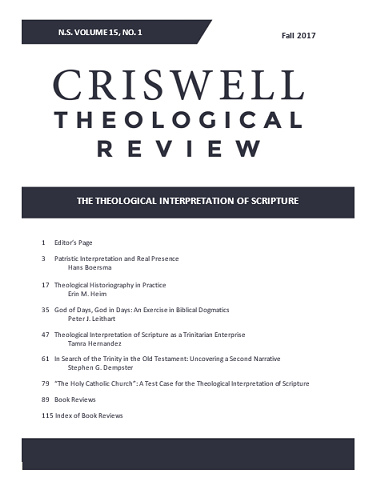 Each article is written by a New Testament scholar who engages an assortment of exegetical and theological issues that are part of the vast spectrum of scholarship on Synoptic studies. We hope that this volume will be an aid to students of the New Testament as well as edify God’s people, the church. There continues to be no shortage of discussion among biblical scholars about the theology of Paul. Monographs, articles, and substantial volumes continue to be published as thinkers engage such important topics as Paul’s view of justification, the law, Israel, Christ, and eschatology. 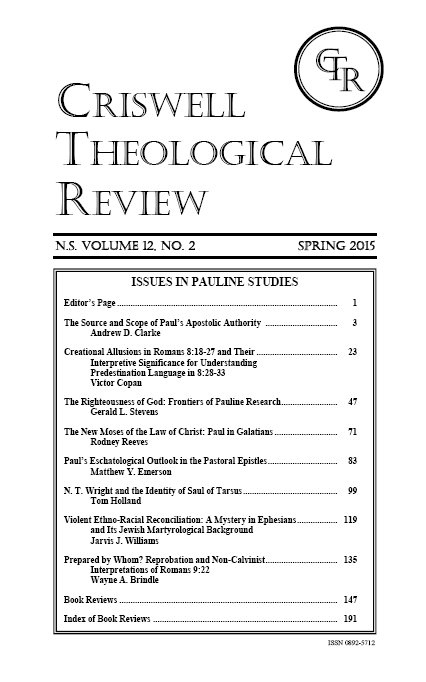 This is why the Spring 2015 edition of CTR is solely devoted to topics in Pauline Studies. Occasionally CTR provides academic forums that are not devoted to a specific theme so contributors can provide specialized essays on a broad spectrum of topics. 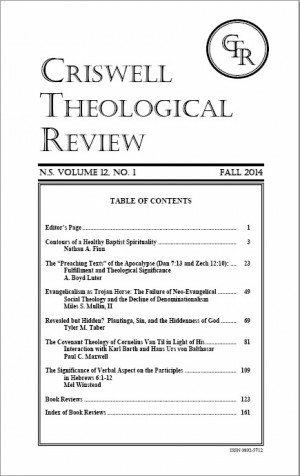 And this Fall 2014 edition serves as such a volume. 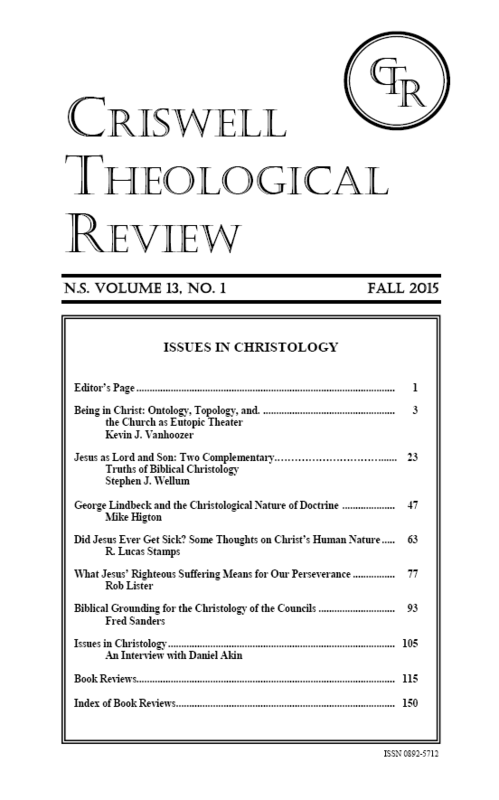 Herein, readers can engage two articles pertaining to New Testament studies as well as individual essays devoted to Christian spirituality, the history of evangelicalism, philosophical theology, and systematic/historical theology. The subject of economics receives attention from a broad spectrum of voices including political journalists and specialized analysts as well as biblical scholars and theologians. The main reason for such an array of interested parties is because the topic touches upon so many issues related to the big contours of everyday life such as work, business, government, health care, and foreign relations. 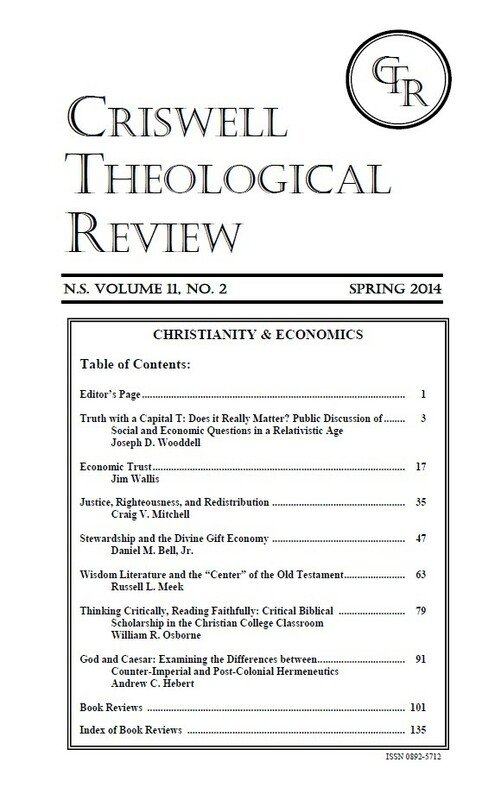 This being the case then, the Spring 2014 volume of CTR is primarily devoted to the subject of Christianity and Economics.